Z-RGR-pNA is a chromogenic substrate for the determination of factor Xa. 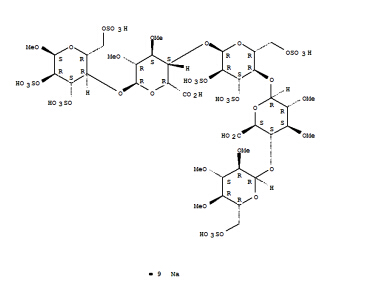 Letaxaban, also known as TAK-442, is a potent, selective, and orally active factor Xa inhibitor, which is a tetrahydropyrimidin-2(1H)-one derivative. Thrombin substrates are often cleaved as well by trypsin and trypsin-like enzymes, e.g. I-1365, I-1560, J-1120, and L-1150. Chromogenic substrate specific for thrombin but insensitive to factor Xa. 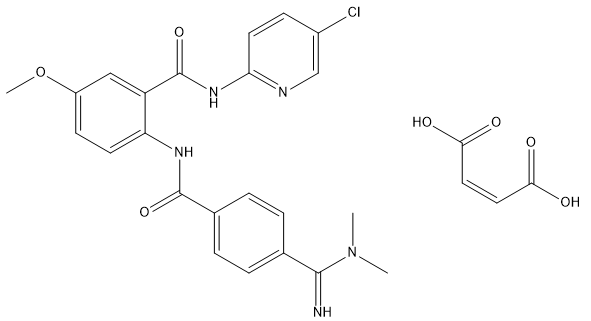 Rivaroxaban is a highly potent and selective, direct Factor Xa (FXa) inhibitor, achieving a strong gain in anti-FXa potency (IC50 0.7 nM; Ki 0.4 nM). 5-R-Rivaroxaban is (R) enantiomer of Rivaroxaban. 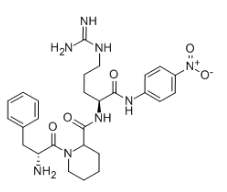 Rivaroxaban (Xarelto; BAY 59-7939) is a novel, oral, direct Factor Xa (FXa) inhibitor in late-stage development for the prevention and treatment of thromboembolic disorders. 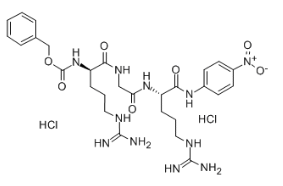 Ozagrel(OKY-046) is an antiplatelet agent working as a thromboxane A2 synthesis inhibitor.